You might have attended a design thinking workshop for a few days or half a day. You might have mapped a customer’s journey, and learned interesting insights by interviewing consumers. Prototyping your ideas with colleagues and testing them may not only have seemed fun, but a great way to develop ideas as well. Now you are back in the office. You have the KPI to deliver; a timeline to meet. What you have learned in the design thinking workshop seems great in theory, but incredibly difficult to incorporate into your day-to-day operations. This is the kind of scenario people across different industries consistently cite that holds them back. On one hand, while it is great to know that ‘design thinking’ is often valued, with organizations attempting to incorporate the practice as an approach to innovation, it is however a pity when these attempts often stop at an interest or trial level due to the challenges companies face in utilising design within their organizations. 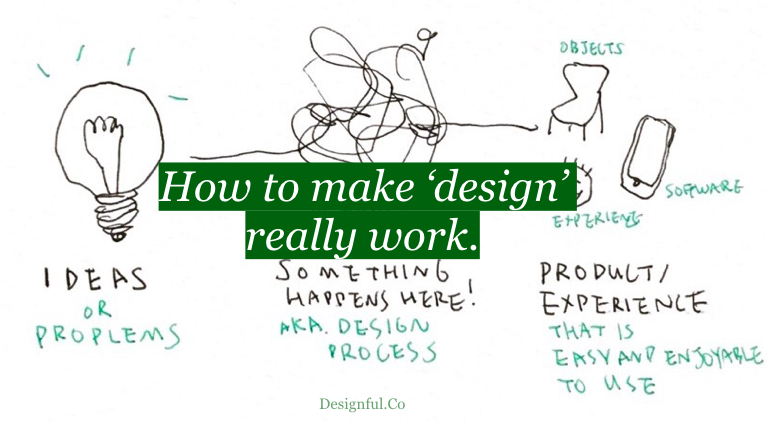 How do we make ‘design*’ really work? Here are three things I learned to make ‘design’ add the most value in the endeavor for innovation. 1. Empathy is fuel for innovation. Deeply understanding consumers and their needs is the essential part of making ‘design’ work, but I’ve seen many businesses skip this part -their thoughts fixated on innovation residing in technology or their competitors, or in the belief that this kind of research takes a long time. In order to make design really work, do not skip this part. Innovation truly is in empathizing with consumers. In fact, start with empathy to create the biggest impact, as is will be your fuel for innovation. And undertaking this kind of consumer research in the design process does not always have to be lengthy. What matters is to ensure proper planning and carving out time to meet consumers. For example, The Design Sprint developed by Google Venture provides a quick yet impactful framework that addresses this. Bring your assumptions and wicked problems to solve and spend a few days to be inspired and craft your problem statement at the outset of an innovation initiative. 2. Innovation lies in humility and constant iteration. Lose the idea of launching a disruptive innovation. We have to constantly iterate and innovate. There is no such thing as launching and having the job be done. The market is constantly changing, as is people’s behavior as technology evolves to offers us new possibilities. In the digital age, your competitive advantage lies in the constant evolution and adaptation to the change. Relying on unchanging value propositions will bring challenges and eventually disruption by new competitors. Have the humility to admit that the current value propositions of your products or services may not be relevant in the near future. The good news is that digital technology has enabled rapid experimentation, it has made it easier and faster than ever to test ideas, to keep going back to consumers needs, to constantly prototype and to iterate the ideas. Stay humble and constantly adapt and seize emerging opportunities. 3. Design is not a department. Build design as a capability. Treat ‘design’ as a capability. It is not an event, or a department. It is a capability that we have to cultivate. While ‘design’ requires a strong foundational education and years of practices just as any other craft, it is still important and possible for people in the organization to learn design as an approach to innovation. By learning and practicing design methods, we can influence our thinking, furthermore actions. If your organization is keen to learn more about how to develop innovation capabilities through design, check out Advancing Innovation Through Human Centered Design, an executive program I designed, which is now available at SMU Academy, the professional training arm of Singapore Management University.